The book of beginnings has always fascinated me, especially those first few chapters of Genesis. There are so many questions that have come to my mind when I read about the creation and the time just prior to and after the flood of Noah. So little is known or even recorded about those first seventeen hundred years of mankind’s existence. One can only imagine what the world must have been like to have precipitated such a cataclysmic judgment upon itself by its very Creator. First, there was this perfect world. A world where man and beast coexisted without fear of each other and, according to several legends from a variety of cultures, a world where they could actually communicate between themselves. It was a world that did not know the agony and despair of pain, disease and death. It was a world where the earth brought forth abundantly of its harvest with barely any effort made by man. This blissful world ended almost as quickly as it had begun. Sin had made its woeful presence known, and as the poet John Milton recorded, Paradise Lost was now a present reality. After this, both the earth and mankind would suffer. The world became inhospitable to man. The roses brought forth thorns, the gardens produced weeds and the earth’s climate was harsh and unforgiving. Truly, man would have to eat bread by the “sweat” of his brow. The pain of childbirth would be greatly magnified. Man would sit around the fires at night and reminisce and tell stories to the young of the “Golden Age.” For over sixteen hundred years, this was the lot of mankind. Years would pass and the sting of judgment would be forgotten. Sin would once again reign in the hearts of men. After Adam and Eve had sinned, Genesis 3:15 records that God came down and confronted them. In Exodus 34, God revealed to Moses his true nature and essence. This is how God described himself to Moses: “The LORD God, merciful and gracious, longsuffering, and abundant in goodness and truth, keeping mercy for thousands, forgiving iniquity and transgression and sin...” Yes, God being holy and righteous had to judge man’s sin but, at the same time, extended his arms of love and mercy to Adam and Eve. While he was pronouncing judgment upon their sin, he was promising them a future redemption. The first century Jewish historian Josephus recorded that, “while Adam was still alive, the posterity of Cain became exceedingly wicked.” By the tenth generation of mankind, evil was rampant over the earth. However, God did not forget his promise of redemption to humanity. Throughout every generation, God maintained a Godly lineage that he would ultimately use to accomplish his redemptive plan. The Bible records that in the tenth generation from Adam there was a man called Noah who was “perfect in his generations.” In Genesis 6-9, the scriptures give the story of God’s judgment upon a sinful world and his love and mercy which was extended to Noah and his family. Noah’s Godly father prophesied over Noah at his birth. God had revealed to Lamech that through his son Noah, whose name means “comforted,” he would remove the curse that he had made upon the ground. This gives us a clue that the antediluvian climate was significantly different than what it is today. This agrees with the words penned by Peter, “the world that then was, being overflowed with water, perished.” In his mercy, God removed a portion of the curse of sin, but not all. The most egregious penalty of man’s sin would require the shedding of innocent blood. This is because God had initially shed the innocent blood of an animal to cover man’s shame of nakedness and sin. Of course, we know that this ultimate promise of redemption was fulfilled by the death of Jesus upon the cross of Calvary. What I have said so far brings us to the real purpose of this brief study. I want the reader to consider a wondrous and marvelous facet of nature, namely, the rainbow. 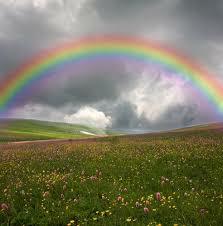 We shall discover that the rainbow is a spectacular physical representation and display of God’s love and redemption. In order to do this, we need to consider the scriptural passage in which it is first recorded. In the passage in Genesis, God speaks about a token of that covenant. The word token simply means a sign, signal or evidence. As such, it just represents the covenant and is not the covenant itself. Notice, too, that this symbol of the covenant would be for perpetual generations. This explicitly implies a sign or token which will be evidenced throughout eternity. Let’s stop and consider this for a moment. How could and even why would God use a token of his covenant to be an eternal representation? It’s time now to consider the actual token in question. God said, “I do set my bow in the cloud.” To begin with, everyone knows that a rainbow is just an arc. An arc, which is just a portion of a circle, is hardly a symbol of something that represents eternity or that which is perpetual. At least, that’s what I thought. Many years ago, I took a moment to look up “rainbow” in an encyclopedia. What I discovered amazed me. Perhaps, if I were not so lacking in knowledge, the fact that all rainbows were complete circles would have been obvious to me. If I had been a “frequent flyer,” I probably would have encountered this phenomenon. Along with this thought is the phrase, “I may remember.” Although I had always had the impression that the rainbow was meant for humans “to remember” that God would no longer bring a flood upon the earth, that is not what the Bible states. Of course, God does not forget. This is merely a language accommodation known as anthropomorphism. In other words, God is being assigned human attributes. The “bow” or rainbow was to be a perpetual reminder throughout all eternity of His covenant-promise, and what it cost God to purchase mankind’s redemption. This is especially brought to mind in John 3:16. Therefore, from God’s perspective (heaven), the full-circled rainbow symbolized His everlasting covenant. The apostle John further documents this truth when he was given visions of heaven in the book of Revelation. In Revelation 4:5, John said that there were “seven lamps of fire burning before the throne, which are the seven Spirits of God.” The number seven in scripture signifies fullness. Fire is used in metallurgy to purify. Thus, the seven colors refracted from the white light serve to illustrate the fullness of God’s holiness. Any student of art knows that there are three primary colors. These primary colors are found within the prismatic colors of the rainbow: red, yellow and blue. Let’s further examine and muse upon these colors. Red - Obviously, if the rainbow is the sign of the covenant, and a covenant necessitates the shedding of blood, then the red must symbolize the shed blood of Christ and, as a consequence, his death. As the sun sets (dies or is buried), many times it appears red. This is because only the longer wavelength of the light spectrum is observed. In Malachi 4:2, we find a very intuitive phrase, “the Sun of righteousness.” This is a definite reference to Christ. Yellow - The color yellow refers to the sun which rises or resurrects from the east. In the gospel of John, it states that Jesus was the light and life of the world. That is why the passage in Malachi holds such significance. The sun represents Jesus in that it gives the earth light and life (through the process of photosynthesis). In First Corinthians 15, Paul states that without the resurrection, we are yet dead in our sins. It is only because of Jesus’ resurrection that we have the promise and hope of eternal life. God, in his infinite wisdom, has provided to us a natural phenomenon that He has used to represent the death, resurrection and exaltation of Jesus. In rabbinic teaching, the Messiah was oftentimes referred to as “bar nivli” or “son of the clouds.” In Ezekiel 1:28, we read about the “bow that is in the cloud” and the “brightness round about.” In this same verse it specifically stated that it was as the “likeness of the glory of the Lord.” Remember in the mount of transfiguration, God spoke through a “bright cloud.” Also, as Jesus ascended from the mount of Olives, he was taken up in a “cloud.” The angels told the disciples that Jesus would return in the same manner in which he left, that is, in a cloud. The clouds represent God’s glory and the rainbow symbolizes His grace. We see this association of clouds and rainbows even in the New Testament. Since the rainbow completely encircles the throne of God, the only way to approach His throne is to first come through the rainbow. Just as the gospel song says: “Some through the water, some through the flood. Some through the fire, but all through the blood.” In theological studies, the shed blood (red) stands for the doctrine of justification. The yellow represents the light and life we receive from Jesus’ resurrection. God is continually forming and fashioning the believer into the likeness of His Son. This is known as the doctrine of sanctification. Finally, in order to be in the presence of God in His throne room, we must be glorified by passing through the royal color of blue. This is known as the doctrine of glorification. In this brief study, we have discovered that this beautiful symbol of promise (the rainbow) is, in actuality, a perpetual object lesson that encapsulates and summarizes the gospel message. We saw that the rainbow in the cloud represented God’s glory and grace. Also, we saw that it embodies Jesus’ death, burial, resurrection and exaltation. Lastly, in the colors of the rainbow, we find the doctrines of justification, sanctification and glorification.